In every winning and losing campaign across Major League Baseball, several moments determine a club’s fate. The Colorado Rockies have come across a copious amount of moments already that have taken them from smooth sailing to alarms blaring. In those moments, the club has seldom come through, falling in nearly every circumstance. While each game has had its share, ahead are the biggest missed moments that have determined the Rockies path. Under the lights of both Coors Field and ESPN’s national spotlight for the first time since 2001, the Rockies were victim to a blowout. There was a sterling opportunity to reverse their fate though. Charlie Blackmon led off the third inning with a triple, only a frame after a gaffe in right field allowed the Dodgers to extend their lead to 6-0. Following his lead, both Trevor Story and Nolan Arenado got a hit, the former a single, the latter, a triple. After a Raimel Tapia walk, the Rockies had two runs in, with a pair on base for Mark Reynolds with no outs. The next three at-bats produced a strikeout swinging, a groundout and a lineout. Though a run scored on Ian Desmond’s groundout, the Rockies could’ve scored at least one more run in the frame, with the possibility for far more damage off a rattled and young Julio Urias. After a pair of losses to start a homestand against their division rivals, the Rockies could’ve used a glimmer of hope. The dreaded “opener” in the form of Ryne Stanek, followed by Ryan Yarbrough was a dreadful sight for the Rockies in game one at Tropicana. Both relievers offered lively fastballs with devastating breaking balls that few starters across the majors possess. Through the first five scoreless innings, that turmoil produced only three hits. In the sixth, the Rockies finally had their chance against a tiring Yarbrough. With one out, Blackmon was hit by a pitch, with David Dahl hitting a single the next at-bat. After Yarbrough was replaced by Wilmer Font, the club got a double from Arenado to drive in one, cutting the deficit to a pair with runners on second and third. With a golden opportunity to tie the game and put the pressure back on the hosts, Story popped out to foul territory and Ryan McMahon struck out swinging. The rest of the game, the Rockies had only one hit. Failing to garner more than a single run was disheartening, a downtrodden fog that followed the club throughout the rest of the series. Having to deal with the lock-tight pitching of the Rays, followed by a pair of red hot offenses in the Dodgers and Braves has lent few late-inning heroic opportunities for the Rockies. Against the Marlins, the chance to capitalize in the final inning arose, down by three. Facing starter-turned-reliever Wei-Yin Chen, Blackmon led the ninth frame off with a double, Dahl walking the next at-bat. With things looking bleak, the Marlins replaced Chen with Sergio Romo, just a night after Romo allowed four earned runs in the same inning. Coming to plate with two on, no outs was Arenado, a familiar and unwanted adversary for Romo. After a career of success against the side-arming righty, Arenado lined out to right, with Story and McMahon going down helplessly soon after. In Romo’s prime, the outcome was to-be-expected. 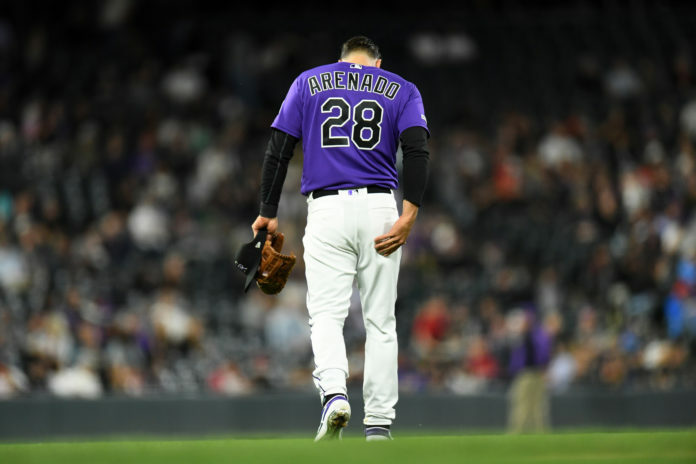 After a disaster in his first outing of 2019, the Rockies had a chance to secure a series win and set themselves up for a sweep the next day. Instead, they fell silently at the hands of the relief pitcher, a precursor for their struggles that lay on the horizon. In one of the longest games in franchise history, the Rockies could’ve ensured it ended far sooner, many times. The most devastating of chances for the club in the 18-inning loss was the eighth. Blackmon led off the inning with an infield single, beating out the throw from second to set up a sacrifice opportunity for Garrett Hampson. After the bunt, Arenado was intentionally walked, with Story shooting a single to left field soon after. Tied 2-2, with the bases loaded and only one out, the Rockies ran into a buzzsaw that is all too familiar. Desmond hit a lazy line drive to Brandon Crawford at shortstop, followed by a strikeout from Josh Fuentes. Despite the litany of chaos against the Giants’ Tony Watson, they were unable to break the tie. The frame was just one of many missed chances in the game as the Rockies finished 2-for-12 with runners in scoring position, 11 men left on base in all. If there was a game that served as a microcosm of the 2019 season for Manager Bud Black and company, Friday night was it. It’s no secret the Rockies were seeking revenge in their first matchup against the Dodgers since losing in the National League West tiebreaker game last year. With Kenta Maeda on the mound, a constant thorn in the side of the Rockies, they had their chance early. In the opening game of the series, the club was down by one heading into the home half of the third. A pair of singles and a walk to start the inning loaded the bases and set the table for a perennial NL Most Valuable Player contender in Arenado. While his damage was limited, Arenado was able to hit a ball to deep left field, driving in Tyler Anderson with a sac fly. With the game tied and two runners still awaiting their trot home, Story came to the plate. A sizzling line drive off a low-and-outside pitch got the crowd off their feet, Max Muncy sending them retreating as he smothered it along the line, stepping on first to conclude the double play and end the inning. From the possibility of a two-run lead on a double down the line to a tie game at one apiece, the Rockies hopes were dashed. Nine runs in the next four innings by the Dodgers served as an insult to injury for the bad break. One can only wonder how the series changes if the Rockies received the benefit of the minuscule margin.